A federal judge rejected the proposed settlement of $765 million in January by the NFL, concerned about whether the settlement amount is sufficient for all affected players. To be honest, $765 does not even come close to what medical bills and treatment would cost over their lifetime. I am not even sure if $2 billion is adequate. UPDATE I: As reported at CNN, Dan Marino is withdrawing his name from a lawsuit suing the NFL over concussions, saying he didn’t realize his name would be attached to the lawsuit. HUH? Well that’s mighty brave of him. I guess suing the NFL is bad for getting a job with the NFL. Profiles in courage. Dan Marino, considered one of the greatest quarterbacks in National Football League history, is withdrawing his name from a concussion lawsuit against the NFL, according to published reports. The news, first reported by the South Florida Sun Sentinel, comes a day after media reports that the Hall of Fame quarterback and 14 other players had filed a lawsuit that claims the NFL knew for years of a link between concussions and long-term health problems and did nothing about it. Marino, 52, said he didn’t realize his name would be attached to the lawsuit. “Within the last year I authorized a claim to be filed on my behalf just in case I needed future medical coverage to protect me and my family in the event I later suffered from the effects of head trauma,” the former Miami Dolphins star wrote in a statement published in the Sun Sentinel and on Sports Illustrated’s website. 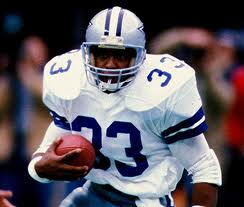 ESPN’s ‘Ouside the Lines’ is reporting that 1976 Heisman Trophy winner, NFL Hall of Famer and former Dallas Cowboy running back Tony Dorsett has been diagnosed with as having signs of chronic traumatic encephalopathy. CTE is a degenerative condition caused by head trauma and linked to depression and dementia. What a crying shame. Another football great from days gone by that has been a victim of concussions over his career. the 59 year old Dorsett played 12 season in the NFL talked about the symptoms that compelled him to seek testing: memory loss, depression and thoughts of suicide. Dorsett discussed his struggles with memory loss and confusion like when he struggled to remember why he was on the plane from Texas to California to get testing. Dorsett also said he gets lost when he drives his two youngest daughters, ages 15 and 10, to their soccer and volleyball games. Sad, so very sad and there are hundreds of former players like this. Get well Tony, get well all! OTL also ininterviewed 62 year old Hall of Famer Joe DeLamielleure, who had a 13-year career as an offensive lineman for Buffalo and Cleveland and NFL All-Pro Leonard Marshall have also been diagnosed with CTE. On the day he received the news that he has signs of CTE, DeLamielleure told OTL, “I can guarantee you my CTE, my tau, came from hits, came from blows to the head.” He said he suffers from anxiety and chronic insomnia, and, like Dorsett, he recounted mood swings and suicidal thoughts. Sorry, but I am a firm believer in two things when it comes to the NFL and concussions. One, every player in today’s game who makes a ridiculous amount of money owes part of their pay check to those that made the game great and built the NFL into what it is today and who have obviously suffered the consequences. Two, the NFL should be ashamed of itself because they had to of known about the dangers of concussions and head injuries to players. But their answer today, is to make the game soft, can’t hit the QB, can’t hit defenseless receivers, can’t touch the helmet, etc. That’s fine for the skilled players, but what about the offensive and defensive players in the trenches where ever play is like an organized rumble? However, the answer is not to take away the hitting in the NFL. Sorry, but like it or not, it is a violent sport. I have played the game from Pee-wees, to high school, to college and trust me, its a pretty hard hitting and yes I have had my fair share of concussions over the years. So much so that in college I switched to rugby for less violence. That would be a joke. But my point being is that the more the NFL makes the equipment and helmets better, the more they make it possible for players to hit harder. And hit they will. How else do they expect to get on ESPN, Inside the NFL and the other football highlight shows? In many respects, because the NFL wanted for marketing purposes to see higher scores and video game offenses, rather than any semblance of defense … they have made the game faster.